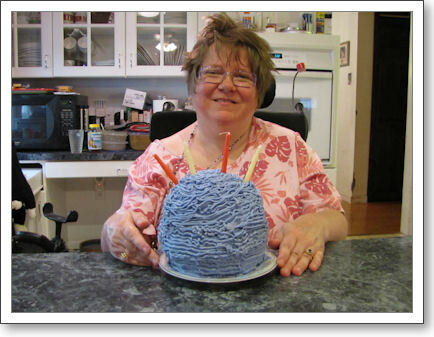 My mommy made me a birthday cake in the shape of a yarn ball! How cool is that? Eat your heart out, Buddy! Great job, mom! And it was delicious, too! Seriously, having a birthday on a Wednesday in the middle of a wacky work week is no fun. It was an especially awful day at the office. But, to offset the bad parts I literally had over 100 birthday wishes on Facebook today–overwhelming! I am gobsmacked. 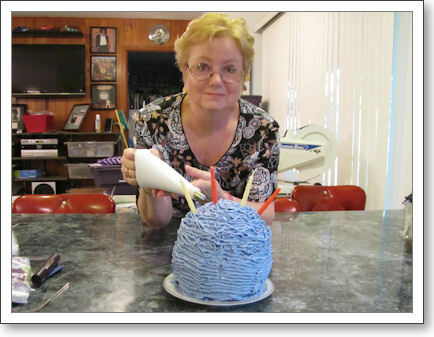 Then to come home to a yarn ball cake? Well, is it too corny to say that that was just the icing on the cake? I feel very loved tonight, even if I feel a little older. So, I guess I’d better sign off and get to bed–the beauty sleep is getting harder to come by at my age. Thanks to everyone who took the time to drop me a note and think of me today. It was wonderful. I love you all! That’s a great cake! Happy Birthday!